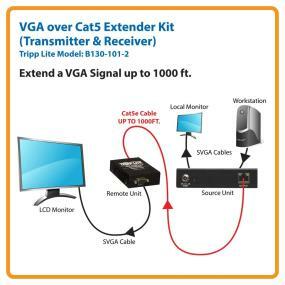 Don’t sacrifice quality for distance—extend a VGA signal up to 1,000 ft. ! 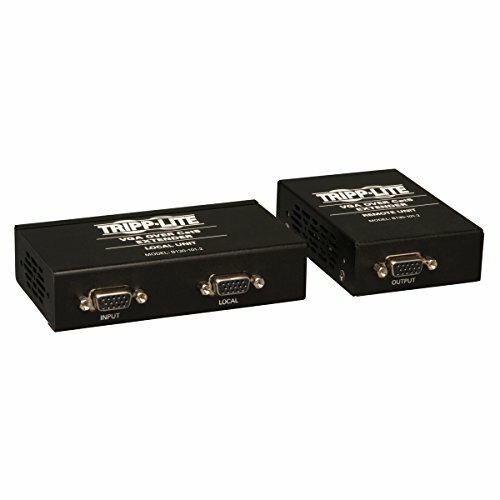 The Tripp Lite B130-101-2 VGA over Cat5 Extender Kit delivers peak performance from VGA-enabled digital video components. When used with 24 AWG Solid-Wire Cat5e/6 cabling like Tripp Lite’s N022-01K-GY or N222-01K-GY, it can extend a 1920 x 1440 (60Hz) signal up to 500 ft. or a 1024 x 768 (60Hz) signal up to 1,000 ft. For maximum image quality between 500 and 1,000 ft. , use Zero-Skew cable such as Tripp Lite P524-01K. This kit comes with both the local and remote connection units, allowing you to plug in and get started right away. With no software or drivers to install, the B130-101-2 provides total plug-and-play convenience. For peace of mind, the B130-101-2 comes backed by a one-year warranty. Extends a VGA signal up to 1,000 ft. The B130-101-2 extends a VGA signal hundreds of feet away from the source, making it the ideal solution for digital signage applications in schools, churches, retail locations, tradeshow presentations and more. 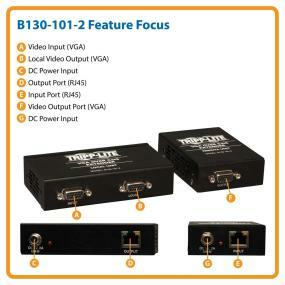 The B130-101-2 allows for the video source to be in a secure, remote location for controlled access while still delivering a signal to TVs, projectors and other devices in another area. This kit includes units for both the source and display side of your application. Package includes: Local (Transmitter) unit 1 x 4.5 x 2.5 (in. ); Remote (Receiver) unit 1 x 2.5 x 3.5 (in. ); Mini-Screwdriver for EQ/Gain adjustment; (x2) Mounting Hardware Kits; (x2) External Power Supply (Input: 100-240V, 50/60Hz, 0.5A Output: 5V, 2A); and the Owner's Manual. When used with 24 AWG Solid Wire Cat5e/6 cable like Tripp Lite’s N022-01K-GY or N222-01K-GY, the B130-101-2 can extend a 1920x1440 (60Hz) signal up to 500 ft. or a 1024x768 (60Hz) signal up to 1,000 ft. This distance can be further expanded with the addition of B132-110 repeaters. Up to 3 repeaters can be connected, with the B130-101-2 receiver at the end of the chain, for a total of 4 sets of monitors. For maximum image quality between 500 and 1,000 ft. , use Zero-Skew cable such as Tripp Lite’s P524-01K. The B130-101-2 features built-in image equalization, allowing you to control the way the image appears on your remote display. There are multiple equalization settings and the unit comes with a screwdriver for easy and convenient adjustment.